One night, a group of shepherds were outside the town of Bethlehem, in fields, watching their sheep. It was a quiet night. The sky was dark and full of stars. All of the sudden there was a big, bright angel in the sky in front of them! “But the angel said to them, ‘Do not be afraid. I bring you good news of great joy that will be for all the people. Today in the town of David a Savior has been born to you; he is Christ the Lord.’” The shepherds were amazed. Then the angel left, just as quickly as he came. As soon as the one angel left, a whole group of angels appeared. They started singing praises to God. 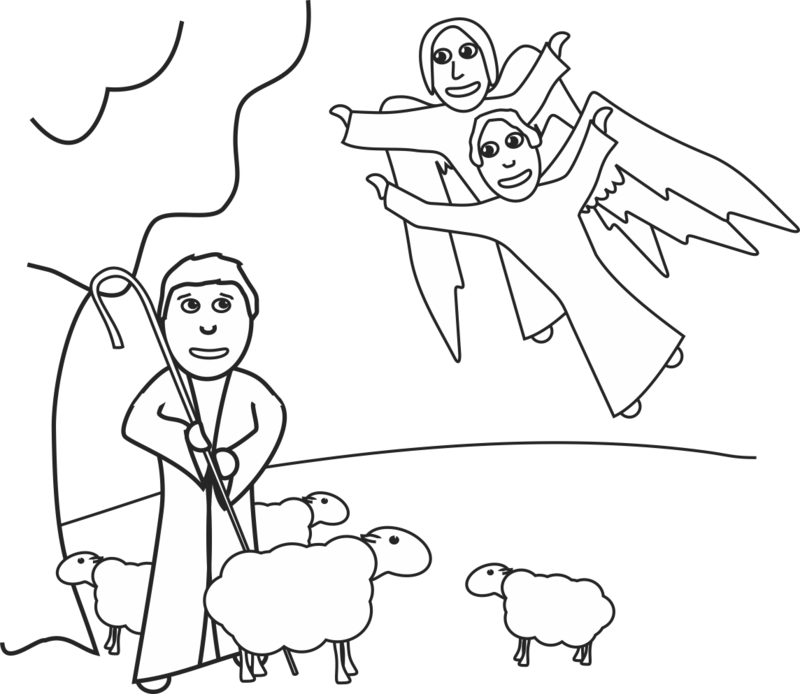 The shepherds ran to town to find the baby the angel had told them about. The angel said they would find the baby wrapped in cloth and lying in a manger. After they found the baby, the shepherds ran around town telling everyone the good news that the Savior had been born. When they finished spreading the news they returned to the baby, Jesus, and worshiped him. When a new baby is born today, many parents like to send out a birth announcement card. (Show birth announcement.) It tells when the baby was born, and all about the baby and is something special people can keep reminding them of the new bundle of joy. God is Jesus’ father. He wanted the whole world to know that His One and Only Son had been born in Bethlehem. So, God sent out a wonderful birth announcement of His own. But rather than a paper announcement, God sent angels! The Savior is finally here! The most anticipated arrival in all history has finally happened. Jesus, God’s Son, has come from heaven to earth to save His people. Jesus’ arrival is a great reason to sing praises to God, both at His birth and today. It is also a great reason to tell everyone we can find about His birth. We no longer have to wait. Our Savior is here! 1. Before the kids arrive to class, hide all your angels around the class. The more kids you typically have, the more angels you should hide. 2. When you give the signal, have the kids find as many angels as they can as fast as they can. The kid with the most angels wins. 1. Before the kids arrive to class, hide all your angels around the class. The more kids you typically have, the more angels you should hide. Make sure you know how many angels you have hidden for each team. 2. Divide the kids into two teams. 3. When you give the signal, have the kids find as many angels as fast as they can. The team to find all their angels first wins. 1. Us the 30-cm plate to draw out a semicircle on the card stock. Cut out with scissors. Glue the sequin as a trim around the curved edge of the semicircle, about 1 cm from the edge using cotton swabs. Let dry. 2. While glue is drying, form wings out of pipe cleaners. Also form a small halo. Glue the halo to the cotton ball with a small amount of glue. 3. Roll the semicircle to form a cone shape. Glue the edges in place and let dry. You may want to staple the join as well, to make the cone more secure. 4. Put a dab of clue on the cotton ball and attach it to the top of the cone. Use clue to attach the wings to the back of the cone. Allow the glue to dry completely. You may also staple the wings in place for added security.